+$When an animated film is set in Oceania, the effects crew must create a constantly moving environment; here's how it was done. +$Disney Animation may be best known for its legendary animators and much-loved animated films, but within the computer graphics community, the studio is also heralded for technical innovations. New tools developed for the effects in upcoming film Moana are once again pushing the state of the art. +$"Kyle and I were both on Big Hero 6," says technical supervisor+$Hank Driskill+$, referring to visual effects supervisor Kyle Odermatt. "We thought of that as an effects movie because 46 percent of that movie had effects. But 80 per cent of Moana has effects," Hank reveals. 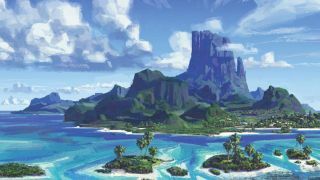 +$Moana is set in Polynesia, which meant that water became one of the biggest effects in terms of on-screen time and difficulty. The main characters, Moana and the demigod Maui, are often in a boat on the water, on the beach near water, or in the water. +$Sometimes the Pacific ebbs into the background. Sometimes the water drives the story, and it even becomes a character. A new solver dubbed Splash made the digital water possible. +$"We wanted to take a step up from what we had done before," explains Hank. "Thankfully, we have two sister companies, Pixar and ILM [Industrial Light & Magic], and we were able to have early conversations with them. Our pipelines aren't shared, and what we're pursuing isn't the same. But, they helped give us ideas." +$When the boat moves through a large plane of water, the challenge was in simulating that interaction without having to simulate the entire ocean. In order to avoid this and reduce computation time, the crew devised a method to slice out water around and behind the boat and then, using Hyperion at render time, seamlessly place it back into the open sea. +$This wasn't the solution for every scene, however. When the ocean turns angry and drives the story with its stormy waters and big waves, a simulation might produce a billion particles crashing around. +$"We knew we'd have times when we would generate hundreds of millions of particles," says Hank. "So, we used distributed computing to solve the simulation across multiple machines." +$Providing the effects artists with time to manage the most difficult simulations was critical. For this part of the process, the crew expanded on a technique used for Big Hero 6. They call it 'foundation effects'. +$For Big Hero 6, foundation effects were temporary effects that layout artists would use to show directors, animators and others timing and placement. Effects artists would replace these temporary effects with real effects later. +$For Moana, the effects artists took the idea further. They built a library of fully realised, ready-to-render effects, such as water splashes and waterspouts, that layout artists were then able to place. These foundation effects would move through production intact. "The effects artists didn't have to spend time on them," says Hank. "They were able to focus on the more difficult problems, such as Maui turning a boat in the water." +$The team typically created data sets for the foundation effects in Houdini. Custom tools gave these effects the ability to travel. +$When the ocean became a character, however, simple rigs allowed animators to puppeteer shapes that the effects animators filled with water. +$Usually, however, the water was the environment. It was this moving environment that, thanks to new tools and effects artistry, helped to make this mythical story believable. +$In this shot, Moana and an ocean wave exchange a high five. Using a simple rig, animators posed a basic shape and set the timing so that Moana and the ocean could interact. +$Effects artists sent a fluid simulation flowing along the outside surface, and accented it with splashes. Inside, another fluid simulation imitated water inside a plastic bag being shaken until bubbles formed. +$An optimised version of Disney Animation’s proprietary path tracing software Hyperion was used to render the final scene, bringing the environment to life as a new character.